Originally from Aria Couture and written by Aria. Shared with permission. 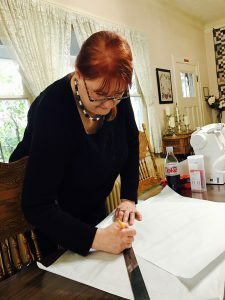 Nora of A Baronet’s Daughter Designs and I are co-teaching a workshop on regency dresses and trims. Today we held part 1, headed by Nora, focusing on construction. I will head part 2 on February 4th, focusing on some popular trim methods. We scheduled this workshop a few months ago, and as luck would have it, there were many marches going on and several people who were interested were unable to make it. All the power to them! If you missed today’s workshop, you are still welcome to part 2. Bring a dress you’d like to trim, or just come to learn how to do folded Van Dyke points, shark tooth trim, and more! Please contact me for a supplies list that is customized according to your interests. Please see this page for more information. We’d love to have you with us on February 4th! There is a modest per-student fee to cover the rental of the space. Nora’s and my time is donated. 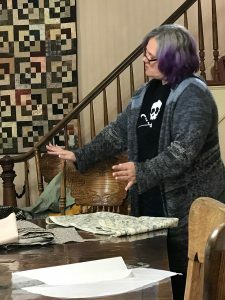 Today’s event was held at a charming shop in Portland, Pioneer Quilts, as will part 2. This is the sort of shop that welcomes you with a crock pot of hot cocoa and marshmallows when you walk in from the cold winter air, with a knowledgable, kind staff, and the feeling of a grandmother’s house. It’s comforting and warm, and it certainly doesn’t hurt that they have a beautiful selection of French General and Moda fabrics! So as expected, we did have a small turn-out, as might be expected. However, we still consider to be a success. Our two students traveled a few hours from Seattle to join us, and quite a bit was accomplished. 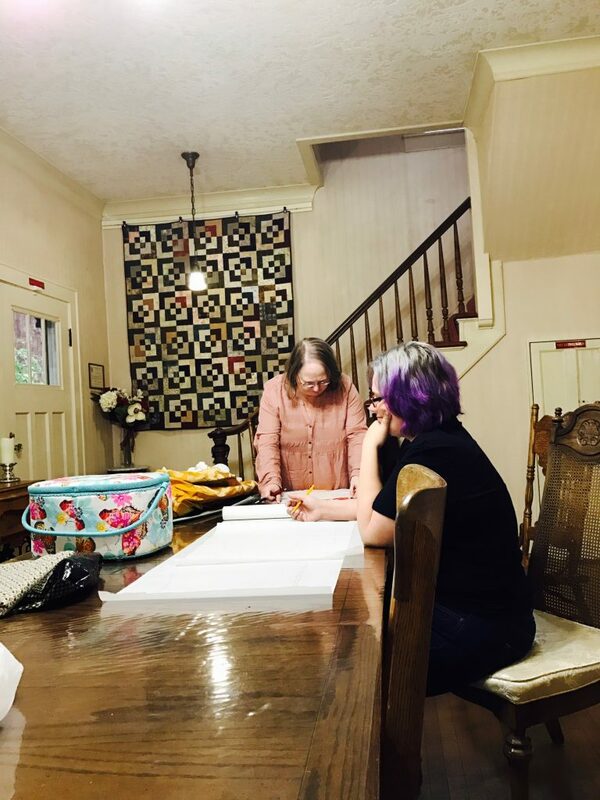 Through modifying a custom pattern to fit their measurements, and making muslin testers, and then back to the drawing board, Miss Mary and Miss Ruth, whose pictures are used with consent to being online, learned a good deal about armcythes and fitting busts. Both of these points are easy to overlook when making gowns inspired by the regency era. 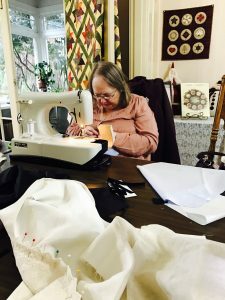 At the end of today’s workshop, each had a custom pattern to take home (this alone is worth the fee) so that they can make more gowns as their leisure. I must comment on Miss Ruth’s machine. She brought in a beautiful vintage Necchi machine. Once upon a time, these machines we the “It” machine for couturiers to use. Everyone from Coco Chanel to Christian Dior used these graceful, beautiful workhorses. But alas, like so many other well-known brands, the good ol’ days are behind us, and we are left with not even a ghost of the greatness we once had. Avoid modern Necchi machines, but if you get the chance to get one of the vintage ones, snap it up! They’re not easy to find, but are highly desirable. We do hope you’re consider joining us for part 2 of this fun workshop series. If you missed part 1, don’t fret. We are planning another for sometime in the spring. 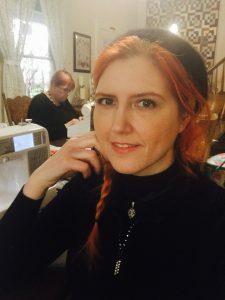 Be sure to subscribe to this blog in the footer of this page to get notifications when that workshop and others are planned.